List Rules Vote up the players that were missed the most by the teams that traded them. The trade deadline is a time for MLB teams to get better and potentially make a run at a World Series title. It can also be used as a time to get rid of some of your star players that you know you will not be able to afford to keep. You may also get rid of a player because they are demanding a trade and are unhappy. Whatever the case may be, trades are supposed to help your franchise out in one way or another. Unfortunately, that is not always the case. Over the years, mid-season MLB trades have come back to haunt franchises for years to come. These in-season trades are certainly some of the worst MLB trades ever made. Imagine having Randy Johnson on your team, but you thought he was a little too wild so you got rid of him. Or maybe you had Mark McGwire, but he was just going to be too expensive for you to keep long-term. Tom Seaver was one of the most dominant pitchers of his time, but forced his way out of New York because of a contract dispute. These are just some of the names of players that teams gave up on for various reasons. This list compiles the 20 worst in-season trades in MLB history. Vote up which ones you think are the worst ever. 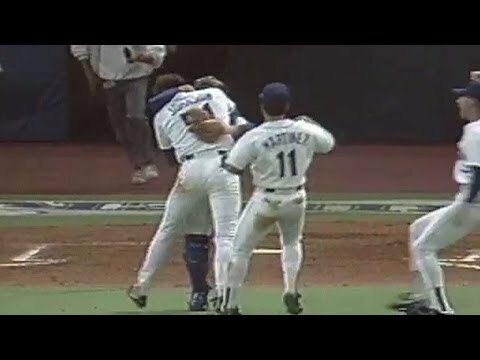 in 1989, the Montreal Expos traded Randy Johnson, Gene Harris, and Brian Holman to the Seattle Mariners for Mark Langston. Langston pitched well for the Expos in 1989, but left for free agency at the end of the season. Meanwhile, a young Johnson began to figure out how to throw strikes in Seattle and became one of the most dominant pitchers to ever play the game. In 1987, the Detroit Tigers traded future Hall of Fame pitcher John Smoltz to the Atlanta Braves for Doyle Alexander. Alexander was at the tail end of his 18-year career, but the Tigers were hoping to make a playoff push. Alexander did help the Tigers make the playoffs, but struggled in the postseason. Smoltz on the other hand began to flourish coming up in the Braves' farm system. Smoltz wound up winning a World Series title with the Braves, a CY-Young award, and transitioned into one of the best closers in baseball. In 1990, the Boston Red Sox traded Jeff Bagwell to the Houston Astros for Larry Anderson. The Red Sox needed pitching so they got rid of Bagwell, just a minor league prospect at the time, for Anderson to try to help their bullpen and reach the postseason. Anderson did make the playoffs with the Red Sox in 1990, but struggled converting just one of four saves and left in free agency the following season. Bagwell made his Major League debut in 1991 and became one of the most feared hitters in baseball. He slugged 449 home runs in 15 seasons with the Astros. In June of 2002, the Montreal Expos traded Cliff Lee, Grady Sizemore, Brandon Phillips, and Lee Stevens to the Cleveland Indians for Bartolo Colon and Tim Drew. Colon was shipped away prior to the 2003 season, while Drew never materialized into any sort of player for the Expos. On the flip side of things, Lee became a perennial All-Star in eight seasons with the Indians. Brandon Phillips was a solid player, while Sizemore became one of the elite outfielders in the game. To say the Expos made a poor choice giving away their core group of players would be an understatement.